Every organization has them, those unsung heroes who show up every day and often toil in the shadows of more high profile members. Like offensive lineman of the gridiron, they aren’t afraid to get dirty even as they do the blocking and tackling for superstar quarterbacks and running backs who get more glory and inspire kids to wear their jerseys. They handle an unbelievably high volume of calls every day, generally from the moment they sit down to the time they go home. Those calls directly translate to our bottom line results. They are master negotiators, ensuring that we meet our obligations in a fair, timely manner while giving respectful service. That means saying “no” at times in the nicest possible manner. They are the living embodiment of our “No Worries, Just Drive” motto. It’s what we sell. When the Claims Department adjusters do their jobs, they ensure we live up to our customers’ expectations. So, today, I want to give a special shout out to these unsung heroes. I could call them out individually if I had room, but instead let me just give particular props to Brett, Ed and Big John, the seasoned Managers and captains of the group (as well as our newest Manager, Jon). They lead, mentor and inspire their teams and for that we (especially Archie and I) are grateful. Thanks! 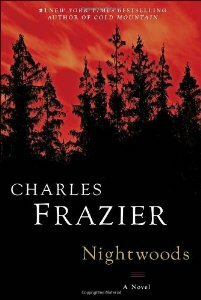 Nightwoods by Charles Frazier: The new novel by the author of Cold Mountain tells the story of a woman in the rurals of 1960’s North Carolina suddenly given charge of her deceased sister’s mute but wild two children. Things take a turn for the worse when their murderous father turns up looking for his missing loot. Frazier is an incredibly gifted storyteller with an incredible knack for simple details that bring the time and place to life.